7th Pay Commission: who is going to benefit from pay hike! 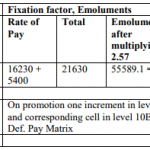 7th Pay Commission: Guess who else is going to benefit from central govt employees’ pay hike! It is not just Central government employees eagerly anticipating implementation of the 7th pay commission and take home higher monthly pay … [Read more...] about 7th Pay Commission: Guess who else is going to benefit from CG employees pay hike!